ANN: kbmMemTable v. 7.77.10 Standard and Professional Edition released! We are happy to announce the latest and greatest release of our memory table. Added support for CASE WHEN THEN ELSE END in both forms. Improved SQL field datatype parsing. Added support for OUT parameters in SQL custom functions. Fixed SQLReplace (Replace) incorrect argument index. Added SQLSplit (Split) custom SQL function to split strings. Added Options:TkbmSQLOptions property to TkbmMemSQL. else use true SQL style format using % and ?. they will be named T1..Tn. Changed to support multiple SQL parsing errors before erroring out. Professional Edition is released with source and additional performance enhancement features to holders of an active kbmMW Pro/Ent Service and Update subscription (SAU). And can be used on Android, IOS, Linux, OSX and Windows 32/64 bit platforms. 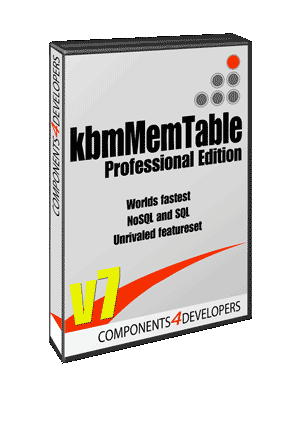 kbmMemTable is the premier high performance, high functionality in memory dataset for Delphi and C++Builder with kbmMemTable Professional topping the scales as being the worlds fastest! If you have an up to date Service and Update (SAU) subscription, then you can immediately visit https://portal.components4developers.com to download the latest kbmMemTable release. If not, please visit our shop at http://www.components4developers.com and extend your SAU with another 12 months.